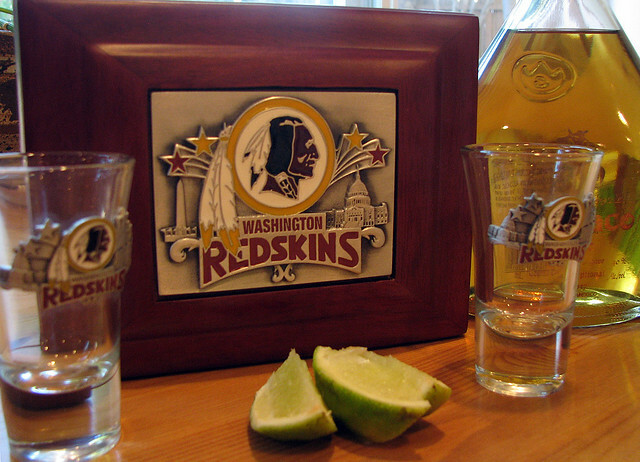 That’s what we were singing as we toasted the start of Washington Redskins NFL training camp with my brand new logo shot glasses, tonight. My dear, lifelong friend, Rich, dropped them and a bunch of other Skins’ swag off the other day. These cast logo glasses, encased in a beautiful Rosewood box, were the centerpiece of my incredible windfall. Of course, I wasn’t going to pull just any old alcohol out of the bar. After all, it was National Tequila Day on Tuesday. I had to go tequila, and I had to go top shelf, all the way! Which is why I reached for the Chinaco Anejo tequila. My introduction to this fine, nutty brand of Agavé juice came about 20 years ago courtesy of a blues rocker named “Doc”. Haven’t found one I’ve liked better, since … and, believe me, I’ve tried! Whether poured straight out of the bottle, or gently shaken on ice and strained (a la James Bond’s martini), it’s unique flavor and smoothness will appeal to any tequila aficionado, and will even convert those nose-turners who cringe when offered a shot of “Ta-kill-ya”. My hope is that Robert Griffin III (aka RG3) and the rest of the Redskin crew will give us many reasons to repeat tonight’s ceremony, and that the 2012 season, and beyond, will be filled with spectacular highlights, Super Bowl victories, and some inductions in Canton, Ohio! Hail to the Redskins! Hail victory!! Hail Tequila!!! 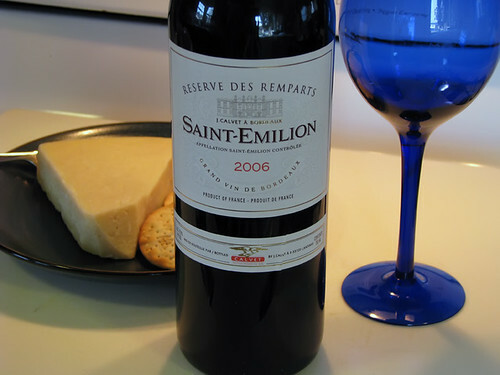 The Saint-Emilion (SE) region is the oldest winemaking area in France. Yet, it didn’t receive Bordeaux Wine Official Classification until 1955. Unlike the other classified regions, the SE wine makers are reclassified every ten years. The most recent classification, in 2006, became embroiled in a battle that ended up in the French courts … which shows you how important these assignments can be to the winemaker. They also tend to hold a lot of weight with wine drinkers, allowing the Grand Cru Classe vintners to charge premium prices for their wares. But, the “lower classes” from the same region often offer very good wines at much friendlier prices. Such is the case with the J. Calvet Reserve Des Remparts Saint-Emilion vintages.